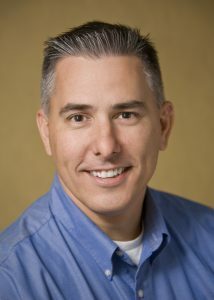 Speaker Alan Hoffler, founder and director of MillsWyck Communications, is an accomplished keynote speaker. He uses the skills he teaches to craft authentic, custom messages that energize and motivate audiences. He causes audiences to think, feel, and re-commit to excellence. Alan believes excellent communication can change a person, an organization, a community, and the world. GREAT speakers get opportunities that ordinary speakers don’t. In his Keynote series, Communicating with Excellence, Alan will show you how communication opens doors in your world and how YOU can be an insanely great communicator! We train our clients to develop presentations to fit any time slot and we practice what we preach! Any of these topics are available in 30-minute, 60-minute, 90-minute, half-day, and full-day formats, and may be presented as a keynote speech, training seminar, workshop, webinar or conference breakout session. We know the rules of soccer, baseball, chess, and Monopoly. Even hiring practices and the cultural conventions of our organization are played with regulations we understand and accept. But what about communication? Meetings. Emails. Presentations. Written content. Blogs. Letters. Pitches. Status updates. Family dinners. How do we win in these highly competitive environments with so much on the line? In this fast-paced and example-filled presentation, come discover and apply the three critical principles that will impress any audience. With immediate applicability to presentations, content marketing, lectures, emails, voicemails, training, and personal conversations, you will find yourself uncovering new ways to use communication for impact. Speaker Alan Hoffler will lead you on a journey that includes the world of college math, medicine, annual reviews, summer camp, and the Gettysburg Address to show you how to create and deliver messages that will ring in your audiences’ ears and have them talking about your message long after you have finished. there IS a standard. 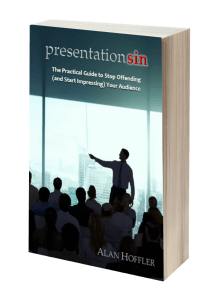 Presentation sins are being committed every day. Presenters are violating the standards in management meetings, sales presentations, job interviews, one-on-one conversations, and keynote speeches everywhere. Speakers don’t even have to know they are offending to be guilty of it. Come take a tour with Alan on the basics of presenting that no one ever bothered to teach you. You will see how simple changes can make you a rock star on the stage. In this humorous and example-filled session, you will recognize yourself and others and find the way to developing skills that will make you stand out among your peers. All the while, Alan will demonstrate the techniques he is teaching, and inspire you that anyone can be a competent and effective presenter. You will never think of speaking the same. You get them every day by the tens, hundreds, or maybe thousands. You attend them every week in chunks, sometimes for multiple days at a time. You participate in dozens every month. You sleep through them, make fun of them, and try to avoid them. This ubiquitous enemy is business (mis)communication — in the form of emails, text messages, voicemails, meetings, webinars, bad slide decks, drop-in visits, and conference calls. All of these messages come at a cost. When your communication is overloaded and ineffective, that cost rises and your productivity suffers. It erodes profit, time, good relationships, and satisfaction. But it doesn’t have to be this way. 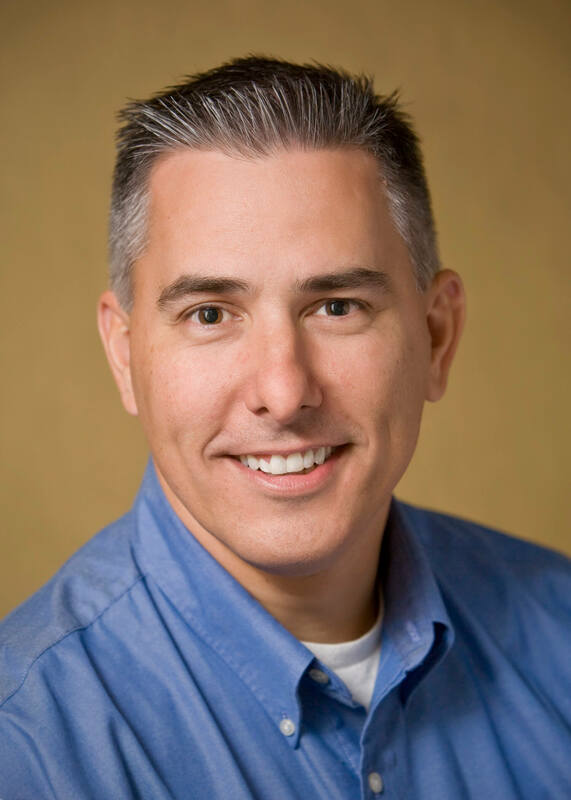 Join speaker Alan Hoffler to discover the keys to effectively using different communication channels in your own organization to save you time, boost your bottom line, and set your organization back on the path of efficiently reaching your goals. In this fast-moving and example-filled keynote, the Four Questions will entertain and challenge you to make the changes that will give you true success. Borrowed from the world of athletic coaching and applied to life, the answers to the Four Questions have the power to get you started on something new, put a new shine on a current endeavor, and provides the motivation to finish a task that seems too daunting to complete. The Four Questions have changed coaches, teachers, sales professionals, clergy, managers, business owners, non-profit volunteers, community servants, elected officials, doctors, lawyers, truck drivers, dishwashers, stay-at-home moms, speakers, and speech coaches. These principles changed my life and they can do the same for yours. Whether you’re a hesitant speaker or a communicator who wants to be GREAT, this session will teach you a valuable and easy-to-learn technique to captivate your audience. In addition to learning about the Silver Bullet, you will practice and apply it to your message, whether it’s a technical work presentation, a networking event, a sales/persuasion situation, or your online content marketing plan. The Silver Bullet can apply to most any situation, takes relatively little preparation, and is used by the masters of the stage and the pen in just about every forum imaginable. You’ll find ways to immediately put this weapon in your toolbox and WOW your audiences and readers and have them ready to listen to your pitch, platform, paper, or presentation. What separates you as a trainer? What defines a rock star trainer? Everyone has been to a bad training class and YOU don’t want to be THAT person! In order to capture any audience, it’s important to immediately show that you are different. In this session, you will discover three critical components to phenomenal training delivery and how to leave your audience with memorable messages. With immediate applicability to lectures, presentations, and formal training sessions, you will find yourself discovering new ways to showcase your training delivery skills. Alan will lead you on a journey that will show you how you can bring powerful delivery to your training and include messages that will ring in your audiences’ ears. When it comes to selling — your product, your ideas, yourself — we often fail to convince others of the passion and commitment we feel inside. Since passion, confidence, and enthusiasm are inferred from our actions, it is crucial for speakers to SHOW these critical components and not rely on an audience to INFER from our content or implications. Sadly, many motivated and passionate speakers fall well short when it comes to convincing audiences of the importance of their message. The results are misunderstanding, loss of buy-in, and missed opportunity. In this fast-paced and interactive talk, participants will learn the two principles of expressing passion and the key secret to making others BELIEVE. Creating presentation content for any audience that engages and emotionally connects with them isn’t always easy. Even (especially?!) those with great knowledge, expertise, and passion about their topic often struggle to create and deliver clear, concise messages that really move their audience. Learn how to rapidly produce engaging content for presentations, workshops, meetings, and client engagements. Learn an eight-step technique for producing ANY presentation. journey through transition points. The change points are expected and predictable; our response to them is not. When we find ourselves in places we didn’t expect, frustration, depression, and inefficiency result. 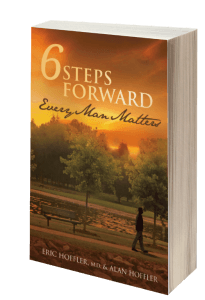 Based on their fictional book that feels like real life, join brothers Eric & Alan Hoffler in a story-filled and introspective look at how we handle change, and the steps required to transition gracefully. You’ll be driven to discover a new purpose, and the path it takes to get there. If you need a half day of inspiration or someone to lead your multi-day retreat, the timeless truths of 6 Steps Forward will give you the hope and motivation to make the next step your best steps yet. Read the bio of speaker Alan Hoffler or contact us today to discuss how your next event can be completed with an engaging and inspiring keynote speech or to get a reference who can speak to the value they received. GREAT job today! THANK YOU! I have honestly had no less than 15 employees tell me today that you were the best speaker in our four years of holding planning sessions. We had high expectations and you delivered. Your message was clear, applicable and you delivered it in a fun and insightful way. Dan DeLeo, Chief Operating Officer, Pool Professionals of the Carolinas, Inc.